People keep journals for many reasons; they may want to catalog their daily thoughts or happenings, or they may want a record of certain issues in their lives. Journals are a great way to express your thoughts and feelings. If you have rheumatoid arthritis, there are many reasons you should consider writing a journal. It can relieve stress, offer relaxation, and even reduce pain. Journaling can help you identify what causes your RA to flare-up and what is most effective to treat it. Let’s look at ways writing an RA journal can help you. You may want to journal so you can get in touch with your feelings. Harboring negative feelings can result in unneeded stress, which can in turn, cause you more physical pain. You might have someone who causes a great deal of stress in your life. Channeling your frustrations to the journal can help lift much of the conflict off of you. Any area in your life that is causing disharmony can be projected into your writing. Sometimes things will reveal themselves when you go back and reflect on what you put paper (or on your laptop, if you are tech savvy). Documenting your rheumatoid arthritis symptoms and other findings can be very helpful for you and your doctor. This can be done by writing down your food intake, symptoms as they occur, and any interventions on your part that help alleviate the pain of your RA. You may find an Android or iPhone app for RA that can help you keep track of all those things and more. This will make it easy to produce a document for your physician to review or just show him/her the app findings on your phone. If you and your doctor can identify foods or daily living tasks that aggravate your RA, then you will know what to avoid in the future. If the doctor prescribes medication for your RA, you will want to write down how well it works on your flare-ups. Writing down your activity is an essential part of journaling. It can be done along with monitoring your food intake. It helps keep you accountable and also is helpful in identifying trends in what works and what doesn’t. You want to find out what will maximize your results without experiencing painful flare-ups. Consistent exercise is important for anyone with RA; by charting your activity, you will have a daily record. Seeing progress with activity levels in your journal can be a great motivation for you. 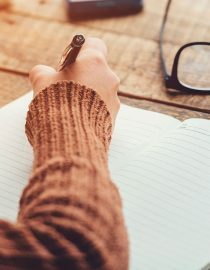 You can go traditional and write in a spiral notebook or if writing with arthritis is too painful you could type your thoughts into a Word document, or anywhere you want; it is your personal journal. Just pick a format and commit to write in it on a daily basis. If you have difficulty with writing or typing because of RA of the fingers, you can opt to speak into a voice-to-text program to get your thoughts down. Special pens are made for people with arthritis that you will want to check out online. If you have a smart phone, take advantage of the several apps that are available to document your RA symptoms, food intake, and activities. Writing with rheumatoid arthritis is an activity many sufferers struggle with. Luckily, there are solutions to help make writing easier and ease the pain.